Doug and I met when I went to work in the same factory he worked in. I got the job in June of 1997. At the time, I was going through a really rotten marriage and knew I was headed for a divorce. Doug played hockey with my department leader, Mick, and they were pretty good friends. I started spending lunch with Mick, and with Mick, came Doug. Being one of very few women in this factory, they picked on me constantly, all in good fun. The two of them very quickly became my closest friends. Beyond friendship, I never had a clue that Doug was interested in me until I had made the announcement that following January that I was getting a divorce. I left my ex in February and Doug immediately asked me out. 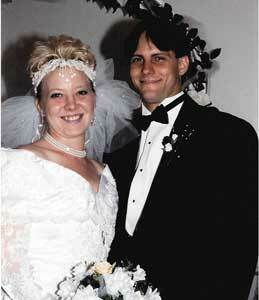 So, on February 27, 1998 we went to a nice restaurant and then to see Titanic. During our first date, we both had talked about how we just wanted a friend to hang out with, nothing serious, no commitment. For me, personally, I thought it would take about five years before I could ever think about anything seriously. But, needless to say, by the end of the night, Doug and I both knew we would be spending our lives together. I fell in love with him instantly. We had been friends for so long and we just knew each other so well. When we started dating we lived 40 miles apart. He would call me every night to say good night and we would talk for hours on the phone. We had the most incredible conversations about our lives and what was important to us, or just about nothing at all that would matter to anyone. Within a month, he asked me to move in with him. We couldn’t stand the distance and living together was the best arrangement for us both. I was driving up here to work anyway, so it just seemed that this is where I belonged. I have never in my life known anyone like him and never will again. Besides working in the factory, Doug is studying to obtain a federal labor card in machinist toolmaking. His passion is hockey. He is a goaltender for a local league here in our hometown of Westland, Michigan. Doug also likes rollerblading and bike riding. As for me, I’m just learning all of this stuff! I am now, slowly sharing his passion for hockey. I enjoy rollerblading and bike riding with him and my daughter Kaytlin. At this present time, I work for the municipal TV station here in Westland. 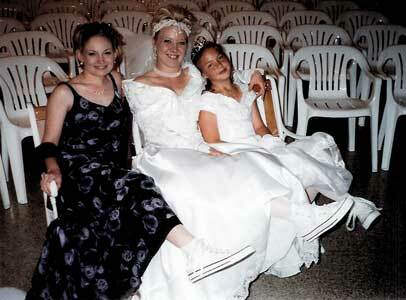 Cheryl and her bridesmaids wore white chuck high tops. That is when I set out to find Converse for myself and my bridesmaids. After about 20 different stores, I finally found them at Sports Authority in Dearborn, Michigan. The girls’ chucks will have special lace shoelaces. I love how they look!! That was probably the hardest thing to find out of everything for the wedding. But it has been worth it to see the look on Doug’s face. This is so Doug, and it makes him happy and that is all I want. I bought my first pair when I started looking for these shoes for the wedding. I now have white Converse All Star high tops. I have never had a more comfortable pair of shoes on my feet. 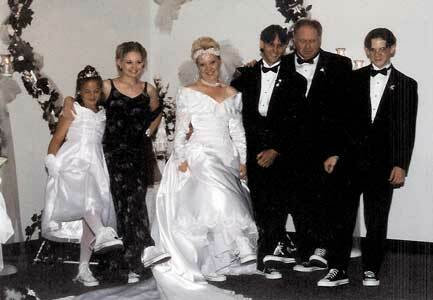 The Abbott wedding party. Here come the chucks!